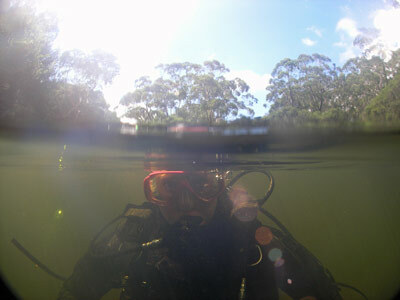 In New South Wales, very few dives are done in freshwater. The only regular dive in freshwater is in the Snowy Mountains at Lake Jindabyne (where people dive on the old town of Jindabyne). Other than that, I have heard that some people dive Bents Basin out near Warragamba Dam, but I know of no-one who has actually done it. In 2008, Kelly and I took a member of our dive Club, Mark Ranft, who lives in Minnesota, USA, and his wife Jill on a sight-seeing trip south of Sydney. 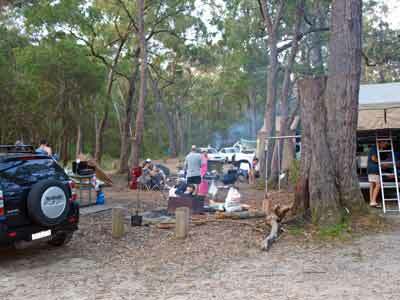 On this trip, we ended up going to Carrington Falls in Budderoo National Park. This is on the top of the escarpment near the town of Robertson. When there, we found a nice little camping area that I did not know existed and next to it, a pool created on a creek. This was called Blue Pool. The water looked clean and the depth enough to make us think we could dive it. In March 2010, I organised a dive weekend for our dive Club, St George Scuba Club. The plan was to dive Kiama Point and then head up via Jamberoo to the camp site and dive the pool. The quickest way to get here from Sydney is to travel down the Princes Highway to Albion Park and then head up the Illawarra Highway to Robertson. Straight opposite the famous Robertson Pie Shop is the Jamberoo Mountain Road. Turn down this road and about 4.75 kilometres along you will see the road to Carrington Falls. Another 1.5 kilometres along this road there is a small sign on the right side that says Blue Pool and Camping Area. We arrived at the camping area at about 1 pm and had lunch and set up our roof-top tent. After this, we geared up and walked the short distance to the pool. The pool is located down a track that runs from the picnic area next to the covered table. At the pool, there is a good entry point as soon as you get to the pool. The exit is a bit further along, onto the rocky stream bottom where the water enters the pool. The pool is at an altitude of 590 metres. 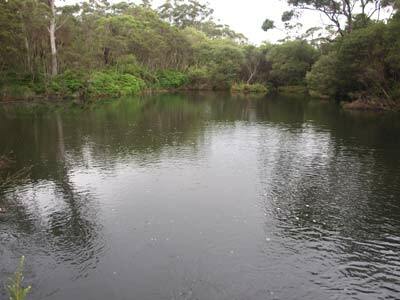 The pool is formed by a small creek running in from the north which has been naturally dammed at the southern end. The pool is probably 60 metres long north to south and 40 metres wide. After putting on your fins, it is an easy flop into the water. Before doing this, make sure that there are no trees or branches in this location. Once in the water, drop to the bottom. It is about two metres deep here. The bottom of the pool is sand in this area. It does not seem to have much silt, although you can still stir it up if not careful. The water is a tanin colour, like tea. It is hard to see how it got the name Blue Pool, as it is certainly not blue in colour. The water is pretty clear for an Australia stream or lake. Generally, we do not get the crystal clear water that places like New Zealand or the Pacific Islands have (or even the Mount Gambier area of South Australia). 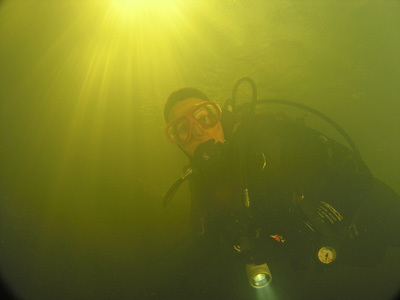 Visibility on this dive was about three metres, but certainly went to as low as a metre when the bottom was stirred up. When we reached the bottom, there was a yabby trap here. Other things seen on the bottom included a car battery, a child's rubber monkey toy, a bollard (what is it doing here?) and a full bottle of beer. This was recovered and later drunk after dinner. There were a lot of branches of trees that have fallen or been washed into the pool. These were not dangerous, but I got hooked up by my torch cable at least once. As mentioned, the bottom in part of the pool is sand. The other part is rock. There are rocks all over the place, mostly on the sides. We headed south across the pool, basically following the deepest part of the pool. The maximum depth of the pool is four metres exact. If you follow the deepest part, you will end up in the back left corner of the pool as you look at it from the entry point. Come back about half way and go up over the rocky wall. This will take you to the right side of the pool. In the afternoons, there are some excellent patterns formed by the sun coming through the trees on the side of the pool. The depth here is two to three metres. Come back to the deepest part and have another look at the bottom. You will see more animals living here. As well as yabbies (which seem quite prolific), there are things than look like Lady Bugs and spider like creatures. 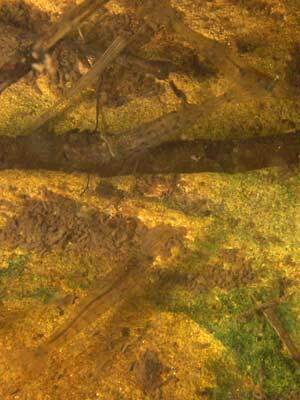 I even saw something that looked like a small stick which was walking across the bottom. On another dive here in 2013 we saw quite a few tadpoles that were about half way to becoming frogs. To finish this dive, head to the spot where the water comes into the pool and climb up on the rock. This is easier and cleaner than getting out where you got in as you will end up covered in mud and sand. 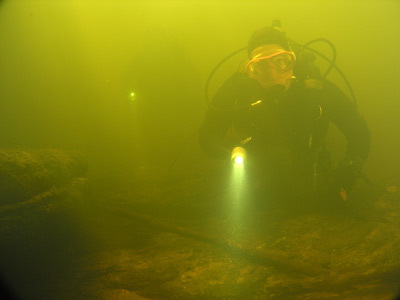 This is a very interesting dive site, one which lets you get an experience of freshwater diving. I only used 25 bar of a small tank for a 20 minute dive, so you can do this on the remains of a tank as we did. Afterwards, we stayed here the night and had a great time. When we first dived here I could not find any information about this camping area on any web site, but since then some other people have posted about the spot. There are at least four or five wood barbecues, four large tables and chairs and space for at least 10 tents. There is also space for a couple of camper-trailers and we had no problem putting our roof top tents up along the side of the middle area. As mentioned, we made a weekend of this trip, doing a dive at Kiama (you could also do Bass Point), the dive here using residual air, camping overnight and some bush walks. One of the most enjoyable and easy dive weekends we have ever done.